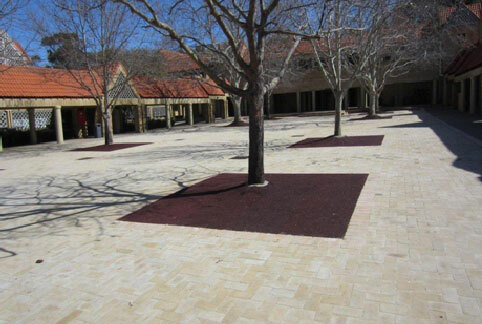 ASTRO’S SYNTHETIC MULCH ( Rubber Mulch) has a large range of uses including medium strips, around trees, garden areas or anywhere a permanent surface is required. The product is porous and allows water to drain through to the soil underneath. The product is dense enough to eliminate weeds. This reduces the need for spraying and maintenance. It can be produced in any thickness. It is very durable and has a life expectancy of appox 20 years. It has the advantage that in heavy traffic areas it cannot be scattered creating an unsightly mess and a slip hazard (as per photograph below). Around trees it can be adjusted to allow for growth. It does not rot or wash away. It is non slippery, hygienic and easy to maintain. Because of its life longevity it is very cost effective as compared to other alternatives. 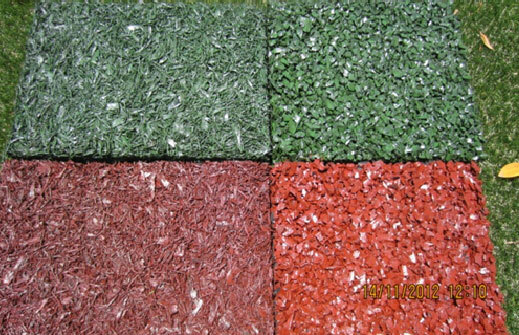 ASTRO SYNTHETIC SURFACES ALSO SUPPLIES AND INSTALLS A RANGE OF HIGH QUALITY SYNTHETIC TURFS, SYNTHETIC TURF CRICKET PITCHES, SOFT FALL RUBBER FOR WATER PARKS, PLAYGROUNDS AND POOL SURROUNDS. Our customers are City Councils, Builders, Architects, Schools, Child Care Centers and residential owners. Astro Synthetic Surfaces takes pride in its professional quality surfaces with our installers having many years experience.